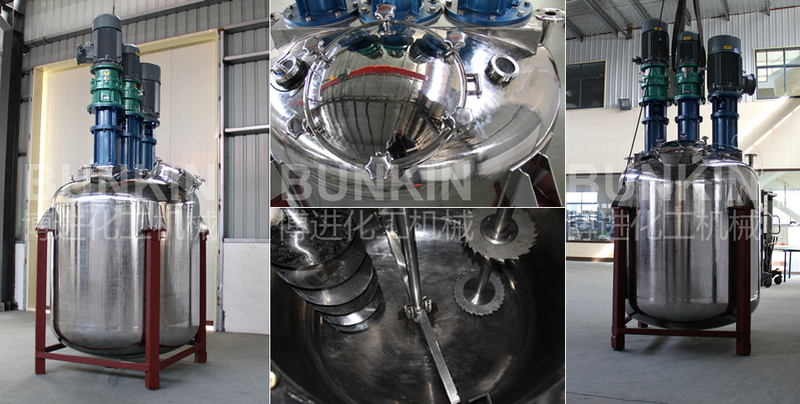 Tank Multi-Functional Disperser_Anhui Bunkin Chemical Machinery Co.,LTD. Applied materials: Suitable for many kind of liquid chemicals emulsion paint, industrial paint, ink and colorants, adhesives, electrics battery pastes etc. 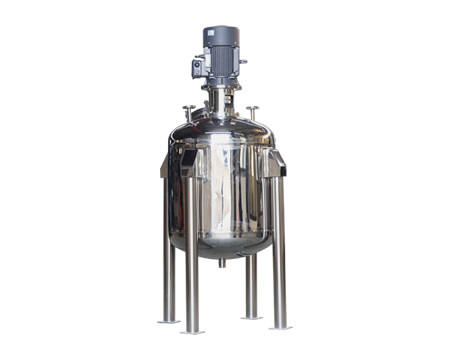 it is used for liquid-liquid or powder-liquid blending and mixing, is a type of large-scale production equipment and has the functions of dispersing, emulsifying, heating and cooling, to fulfill different production process requirement; It can be stably running for long time, has the advantages of small noise, simple operation and strong adaptability, is the ideal multi-functional equipment for mixing and dispersing. The agitator rotates towards a fixed direction driven by the power unit; during the rotation, it drives materials to rotate radially and axially. Materials inside the reactor are in both axial and circular motion, generating several forms of mixing such as shearing mixing and diffusion stirring. Thus the material can be effectively rapidly stirred and mixed. Dispersing disc rotates in high speed, generating annular flow, resulting in strong vortex, thus the materials spirally down to the bottom. Strong shearing and friction force between particles get the mixture rapidly dispersed and dissolved. The circular motion of the stirring disc generates good radial effect, accelerating material circulation, improve the dispersing efficiency. Precision-engineered stator and rotor match with each other perfectly. High speed motor drives the rotor to rotate, which generates vacuum condition between the stator and rotor. So materials are sucked into the chamber from the top of the stator&rotor and also from the bottom. Rotor driven by the strong kinetic energy creates high linear speed, which puts the materials under comprehensive action of strong crushing, tearing, centrifugal extrusion, hydraulic friction etc between the precision-engineered gap of the stator and rotor. After processed, the materials are flying out and generate strong turbulence under the action of force from different direction. Stable emulsion is obtained after repeated disaggregation, dispersion, homogenization, shearing for a certain period with help of mature production technology and certain quantity emulsifier. Equipped with mixing and scraping, it can mix more evenly and thoroughly. Applied materials: Suitable for many kind of liquid chemicals emulsion paint, industrial paint, ink and colorants, adhesives, electrics battery pastes etc..
We have years of mixer application experience of various industries. Reasonable agitator and rotation speed will be recommended according to the materials property and different mixing effect. And the materials will carry out axial and radial motion at same time to mix the materials thoroughly and uniformly within a short period. According to the requirement, the kettle can be equipped with 1 or 2 high speed disperser or emulsifier. The highest rotation speed of the disperser and emulsifying equipment reached to 3000rpm(normally 1450rpm), the linear velocity is up to 20m/s, which quickly spread the powder evenly to the liquid; under the extremely high shear force, the materials uniform dispersion, thus from a good suspension effect. The dispersing disc fixed on the shaft via clamping bolt, easy to disassemble and changed, can be cleaned easily. The agitator fixed on the main shaft by bolts, convenient to move and disassemble.